If you’re looking for a great men’s haircut in Old Town, you have a lot of options. But when you want the best barbershop in Old Town, you’re in good hands at State St. Barbers. We offer custom haircuts to men of all ages, and our professional barbers and stylists work hard to ensure you look and feel your best when you leave. We are proud to offer a variety of services for men of all ages to ensure you feel clean, confident, and stylish. No matter what style you’re looking for, we’ve got you covered. Beard Shaping: Your face is the first thing people notice about you, so make sure your beard is well-groomed with our beard shaping services. Hot Lather Shave: Hot lather shave service includes dollops of warm lather and a pinch of cooling aftershave balm. You’ll feel like a king. Grey-Blending Services: If you want your hair to look a bit more youthful, this is the perfect service for you. We blend away your grey in a subtle way so you look completely natural. Gentleman in Training Haircut: Perfect for the young men in your life, this haircut service is offered to our guests ages 12 and under. Gentleman in Waiting Haircut: If you’re a student on a budget, this is for you—our signature haircut services offered at student pricing. Signature Haircut: Our signature men’s haircuts in 60610 include a straight razor neck shave, hot face towel, and a mini neck and shoulder massage. You’ll love the way you look. In addition to experiencing a luxurious grooming service here at State St. Barbers, you can also expect us to use top of the line products. We’re proud to use and sell Men’s Dept. styling products, Layrite Original Pomade and combs, Beard Balm, Duke Cannon Man Soap, and Proraso shave products. Our Old Town barbershop is located at 1545 N. Wells St. We’re open seven days a week, and although we do accept walk-in clients, we suggest making an appointment for the best possible experience at our shop. 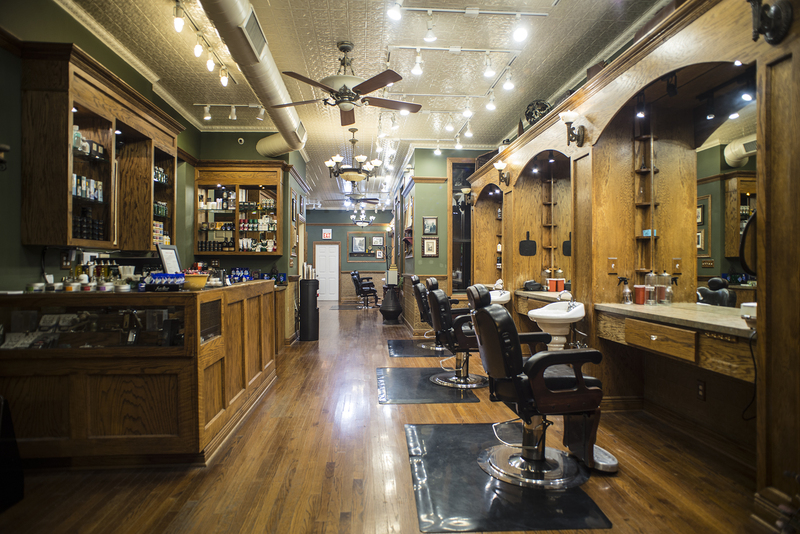 To book your appointment with one of State Street Barbers’ professional barbers, click the link above or call today at 312-787-7722.To find out more about the best men’s barbershop in the 60610 area, visit State St. Barbers today.